In nearly five decades as an archaeologist I have analyzed or supervised the analysis of more than a million potsherds. The collections have originated from sites across a broad sweep of territory, from Wyoming to northern Mexico and from California to Texas, but most have come from the sites on the Colorado Plateau, otherwise known as the greater Four Corners region. . . The Office of Archaeological Studies (OAS) conducts archaeological research projects throughout New Mexico with a diverse group of 25–40 archaeologists and support staff. Our mission is to identify, interpret, and share information about prehistoric and historic sites across the state. The office serves state agencies and private organizations that need archaeological studies performed as part of their development projects. In addition, we also provide ethnographic and historical research services. We have an education outreach program that directly interacts with New Mexicans in order to answer their questions about archaeology, history, and the heritage of New Mexico. Under Chuck Hannaford's leadership, that program has twice received the Society for American Archaeology's Excellence in Public Education Award, in 2005 and again in 2012. 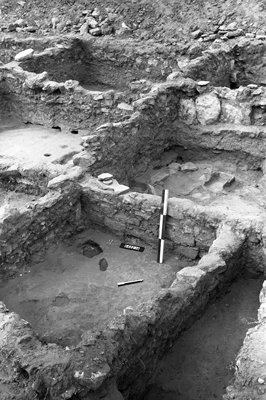 In addition to client-initiated projects, the Office of Archaeological Studies conducts research projects that are funded by grants and private donations. Many of the projects make use of a dedicated corps of volunteers. The office provides training opportunities for university students and makes use of their skills in the latest technology. We also collaborate on archaeological projects with Mexico's national archaeological program and have held educational outreach programs in surrounding states. The office has five specialized laboratories, a small library, and a publications department. We have nationally recognized specialists in pottery, botany, and osteology, and our archaeomagnetic dating laboratory is one of two full-time laboratories in the United States that are dedicated to this dating technique.